This temple was built by Suryavarman and is considered the biggest Asian pyramid. It is over 200 feet high and divided in several layers. The central part has four towers in the shape of a lotus flower. This temple is the largest in the whole complex and is where the historic site gets its name. The central temple complex has 2,600 feet of bas-reliefs, including famous battles and Buddhist scenes like the Battle of Kurukshetra, the Army of Suryavarman II, Heaven and Hell, Churning of the Ocean of Milk, Elephant Gate, Vishnu Conquers the Demons, Khrisna and the demon King, Battle of the Gods and the Demons, and the Battle of Lanka. Built by Jayavarman VII, the temple stands in the center of Angkor Thom. With its 54 towers and 216 faces of Avalokiteshvara, this temple looks best in the morning just after sunrise or at the end of the afternoon when the sun shines on the faces. The temple was built on 3 levels: the first 2 are rectangular, while the 3rd is circular. This was my favorite—I really got a kick out of exploring all the little halls, rooms, and photographing the many faces. Still covered by the jungle, this place is exactly as they found it. Ta Prohm makes it easy to imagine how the whole complex looked when it was re-discovered in 19th century. This is the temple made famous in Tomb Raider. If you come early, you can avoid the crowds who arrive mid-day. It’s the second best complex behind Bayon. A huge baray surrounded this temple complex during its prime. Because it was encircled by water and was like an island, there was no need for enclosures or moats that became customary for temples in Angkor. East Mebon has five towers- make sure to climb the central platform to the towers, and check out the intricate stonework. About 2000 feet south of the East Baray lies Pre Rup, built by Rajendravarman as his capital after re-establishing Angkor once he took over as king. 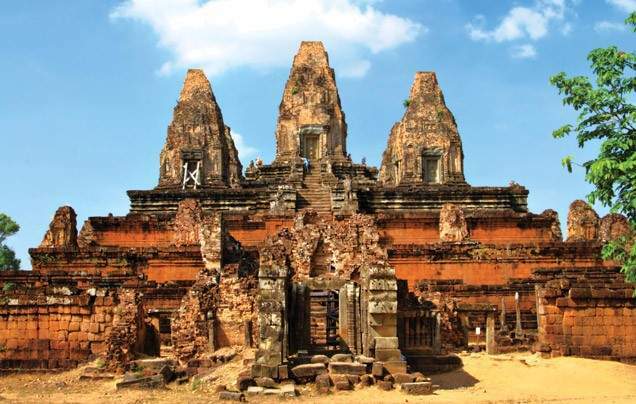 Pre Rup was at the center of a city that has long since vanished. You can climb the steep steps up to the three tiers of the pyramid. this spot was once a major bathing spot for every living thing, elephants aside, in the area. Today it is the most popular place for local children to swim. This temple has the same style, structure, and founder as Ta Phrom. It is almost like its little brother. The major feature that sets it apart is a huge tree that grows atop the eastern Gopura. It is slowly destroying the building, but it makes for amazing photo opportunities. It’s the temple normally featured in movies and photos. On the road between Angkor Wat and Angkor Thom, you can find a single tower that was built by Harshavarman I (910-922). It’s one of the few ruins accredited to him, and he had it built to honor his father who was responsible for the construction of Phnom Bakheng.